ON A PLANE OVER THE CHANDELEUR ISLANDS, Louisiana (AFP) – An impromptu recovery fleet rushed to an uninhabited US island chain in the Gulf of Mexico as the leading edge of a giant oil slick reached its shores. Twelve shrimp trawlers and 10 official response boats frantically laid protective boom around some of the Chandeleur Islands -- a prime marsh and wildlife area -- but initially failed to confirm any land impacts. BP chief operating officer Doug Suttles said it was "the first report of oil coming toward shore" in a two-week crisis that has gripped the ecologically fragile US Gulf coast. 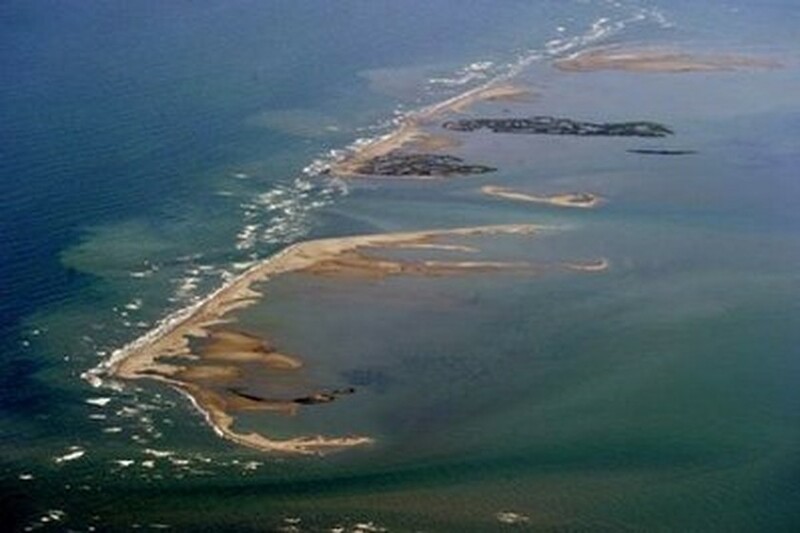 The islands form the easternmost point of Louisiana and are part of the Breton National Wildlife Refuge -- the second oldest refuge in the United States and home to countless endangered brown pelican, least tern and piping plover shorebirds. AFP journalists on an overflight of the islands saw reddish brown streaks of oil surrounding some of the islands and said light sheen appeared to be lapping the shore in certain places. The US government's NOAA weather agency has been predicting for days that the sheen on the edge of the slick at least could hit the Mississippi River Delta, the Chandeleur Islands and nearby Breton Island. Two weeks after the Deepwater Horizon rig exploded, the full impact of the disaster is being realized as a massive slick looms off the US Gulf coast, threatening to wipe out the livelihoods of shoreline communities. If estimates are correct, some 2.5 million gallons of crude have streamed into the sea since the BP-leased platform spectacularly sank on April 22, still ablaze more than two days after the initial blast that killed 11 workers. The riser pipe that had connected the rig to the wellhead now lies fractured on the seabed spewing out oil at a rate that could see the spill rival the 1989 Exxon Valdez environmental disaster in Alaska. ExxonMobil was forced to pay out 3.4 billion dollars (2.6 billion euros) in clean-up and compensation costs for that tragedy which crippled Alaska's shores as well as its coastal communities, and BP is anxious to make sure Louisiana's ecologically fragile wetlands don't suffer the same fate. BP is preparing to deploy a 98-ton containment "dome" to try to stem the tide of oil gushing into the Gulf of Mexico and avert an environmental catastrophe. The operation to place the giant structure over the largest of three oil leaks is unprecedented and, facing depths of almost a mile (1.6 kilometers), remote-controlled submarines will have to guide it into place, hopefully by the weekend. More of a cube than a dome, workers painted the rust-colored tower white so it could more easily be seen on the ocean floor and tested its weight amidst a series of checks before it was set to be loaded off the dock. The British energy giant has been operating a fleet of robotic submarines in the murky depths to try to activate a 450-tonne valve system that should have shut off the oil automatically when the initial blowout occurred. Louisiana Senator Mary Landry said she met with BP CEO Tony Hayward, and urged the cash-rich company to "devote every available technology and resource, including engaging industry-wide experts, to stop the flow of oil." Landry said she "raised the issue of damages on behalf of industries that may suffer in the short- and long-term." Another remotely-operated vehicle has been pumping dispersant directly into the leaks, but BP says it is too early to know if this was having a significant impact on the amount of oil reaching the surface. BP began operations on a relief well Sunday, penetrating the sea floor as it started drilling down to approximately 18,000 feet so that special fluids and then cement can be injected to seal off the supply. But with this process expected to take up to three months and a slick the size of a small country looming off Louisiana and threatening states from Texas to Florida depending on the wind, the dome is seen as a vital short-term fix. The idea is to place the dome over the main leak to trap the oil so it can be funneled up to the Deepwater Enterprise, a ship that can safely process and store the crude-water mix. Suttles said teams operating the underwater submarines hoped to seal one of the three leaking points later Tuesday by placing a valve over it, but stressed this would not alter the overall amount of oil pouring out. Officials spotted several oiled pelicans on a barrier island off the Louisiana coast Tuesday but so far the nesting area there appears to be clean of oil. They managed to capture one of the oiled brown pelicans and bring it to a rescue center in Fort Jackson to be treated and cleaned. It was just the second bird rescued so far, but it will not be the last. "The biggest concern is the birds that are near land because that's where the majority of the birds are and the majority of the sensitive species are, as well as the sensitive habitat," said Erica Miller, a veterinarian with Tristate Bird Rescue who helped clean the bird. "As long as the oil can be kept away from shore that's going to save a tremendous amount of birds."